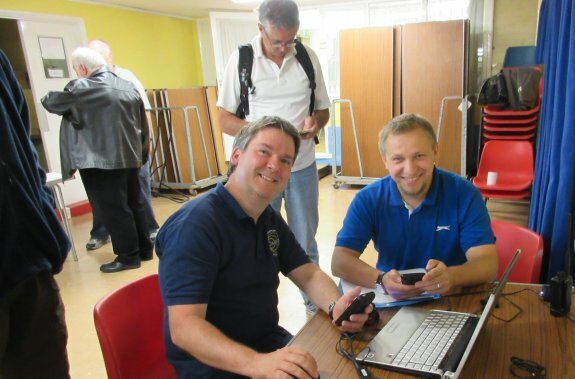 Monday the 18th of August was another busy Amateur Radio Skills Night at the Village Hall in Danbury. 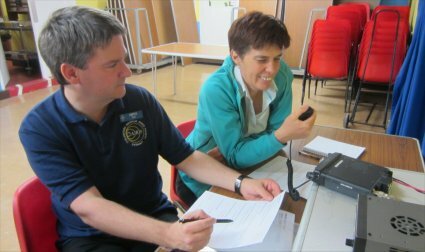 This was the eighth Skills event held by the Chelmsford Amateur Radio Society (CARS), and due to it being holiday season, the team was expecting a slow evening, however over 40 amateurs attended, including people traveling from St Albans, Colchester and three visitors from MARTS and BRATS clubs in the Medway area. A first for Skills Night, and possibly the star attraction for the evening – personalised engraved callsign badges. 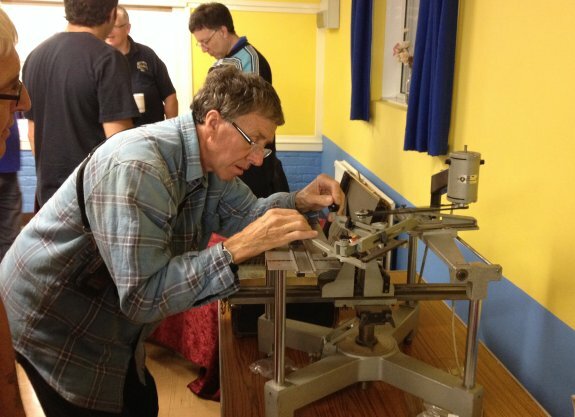 Jim 2E0JTW, ably assisted by Glynis 2E0CUQ, brought along his impressive (and heavy) engraving machine and was able to make callsign badges to order in a range of colours and styles. A rough count shows that around 15 callsign badges were produced, and we’re hoping that we can persuade Jim to result next month as there’s clearly a demand for engraved callsign badges. 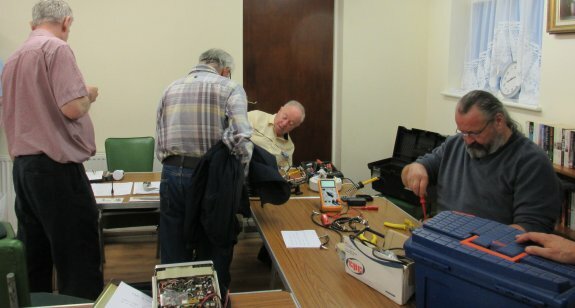 Despite being tucked away in the smaller of the two rooms, the team was pretty busy helping out with construction advice, with soldering irons at the ready for any repairs or soldering practice – thanks to the team for helping our Sarah M6PSK with a quick fix to a faulty iPhone charger too. 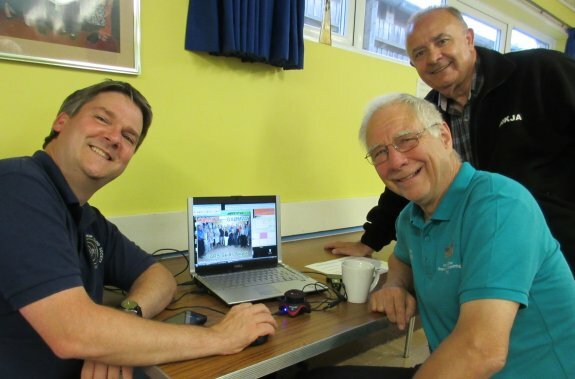 As ever Carl G3PEM was on hand giving out valuable HF advice, with the aid of his trusty whiteboard and his laptop with antenna modelling software. Following discussion on a recent Monday Night Net, Pete M0PSX offered demonstrations of Slow-Scan TV (SSTV) – Using the free software package MMSSTV, Pete showed how to create templates of images and text ready to send, and also how to decode, store and reply to received SSTV CQ images. Pete also provided copies of his SSTV Getting Started Guide, and demonstrated a customised CARS Skills Night SSTV image. When Pete wasn’t conducting a demo, the station was running a scrolling display of received SSTV images, including some received from the International Space Station. Thanks to the Essex Repeater Group team for setting up a table to help with awareness of ERG and to answer questions about the local repeaters. The stand was manned by Clive G1EUC, Murray G6JYB and James 2E1GUA – the table was located conveniently close to the tea and the custard creams! A very interesting mix of questions in tonight’s quiz, hosted by Clive G1EUC. It’s played just for fun to point out different aspects of the hobby and to stimulate debate. Questions this time around covered bandwidth, SWR, gain and satellites. Those looking to make use of wi-fi, either for demonstrations or a free data connection for web browsing could make use of the free Essex Ham Wi-fi Hotspot – handy for pulling up specs for Slim Jim antennas, and even for cheating on the quiz questions, if reports are to be believed! 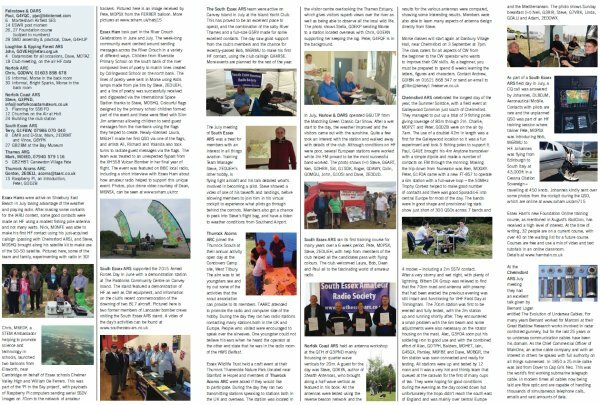 Thanks also to Myra, David and Sarah for ‘logistics’, Charlie M0PZT for laptop soundcard tech support and to all exhibitors, the CARS Training Team, and to everyone who helped make the latest Skills Night a success. The next Skills Night is set for Monday the 15th of September. We’re always on the lookout people to help out at Skills Night, so please get in touch if you’d like to help. As always, suggestions for topics, demos and repeat performances are appreciated… Take The Skills Survey! Whats this EssexHam Wi-Fi all about? Nothing special… A lot of the demos make use of Internet (APRS, RBN, PSKReporter, etc), and messing around with lots of dongles isn’t ideal, so I use a laptop to share a Wi-fi access point out using a 3G connection. As there’s bandwidth, I let anyone use it.